New Norm E-Liquid - Nana's Berries 60mLExpect the unexpected. 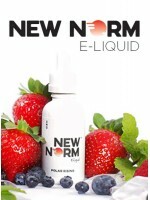 Sweet and tangy strawberries, blueberr..
New Norm E-Liquid - Polar Rising 60mLA glacial berry blast of goodness. Succulent strawberries, blue..
New Norm E-Liquid - Poser 60mLJust like any good poser, this super sweet fruity vape changes flavor ..